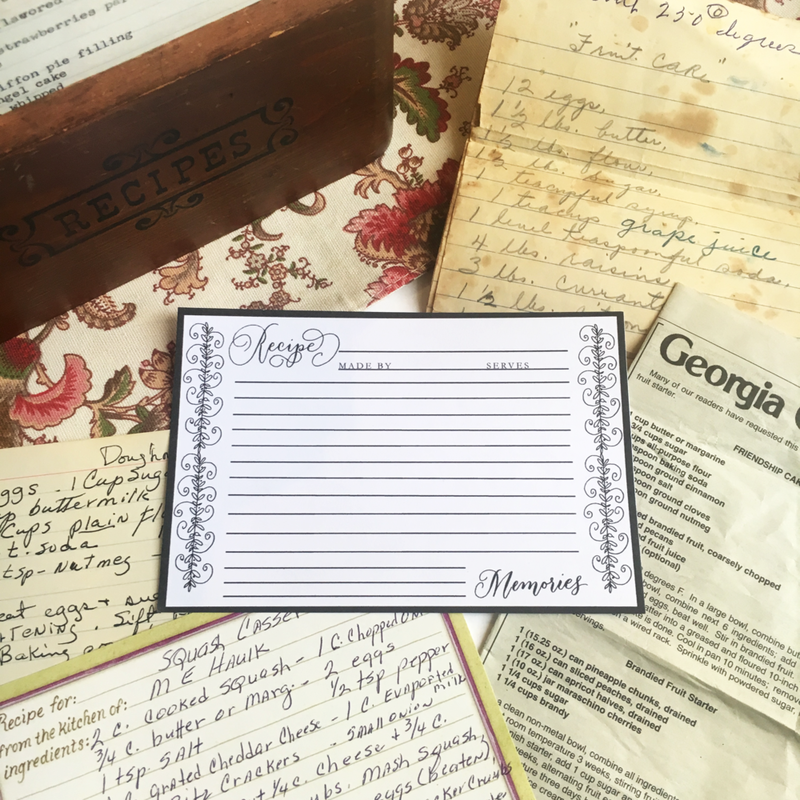 In the next blog post, I will go a little deeper in sharing with you some of my most cherished possessions: old handwritten family recipes from my grandmothers and aunts. Until then, enjoy this day and make memories with the ones you care about the most! Love and blessings! I was so honored when a very special hostess asked me to create these invitations. I have known Mrs. Sharon for more than sixteen years, and she is one of the best examples of a true southern lady. Mrs. Sharon is one of the most kind, strong, and hospitable ladies that you will ever meet. She planned this brunch to honor a sweet expecting mother of two precious baby boys, who will be here very soon. For this invitation, I used pointed-pen calligraphy to create the handmade elements of the invitation. First, I designed a classic monogram that featured the initials of the twin boys' first names. I enclosed the letters in a simple rustic wreath. Then, I drew the rest of the handmade elements in traditional copperplate calligraphy. After I digitized the calligraphy, I printed the invitations on beautiful paper from K.A. Artist Shop, Athens, Georgia. I lined the cream envelopes (also from K.A. Artist Shop) with a custom liner I created to to match the invitation. Each invitation was addressed with pointed-pen calligraphy. Beautiful botanical stamps completed the look. Our little guy turned one recently, and we celebrated with a barnyard birthday. While I did the calligraphy for the invitation and chalkboard signs, I used ideas and the cute printables from Fisher-Price's Hostess with the Mostess website to complete the decorations. The invitation included simple script and type printed on ivory Papersource cardstock and light blue Papersource envelopes that I lined with cute scrapbook paper. The printable is from Fisher-Price's website. The printables were used as cake toppers and centerpieces. Handmade chalkboard made by @135_custom_furniture. Check out his work! Milk bottles filled with flowers from our yard and arranged by my Mama. Delicious cake made by Publix and topped with Fisher-Price printables. The appetizer "barnyard buffet." Don't you love the deviled eggs presentation in the egg carton? Those eggs were from my Mama's chickens. The backdrop was another idea from the Fisher-Price website. My mother-in-law was kind enough to make it for me! I was honored to take part in this wedding because the bride, Katie, and her family are so special to me and our community. Katie and Brantley were made for each other. When I met with Katie and her mother to discuss her wedding calligraphy, Katie's eyes sparkled when she talked about her upcoming marriage. She told me the story behind how she met her guy, and it was obvious that it was a "God thing." They got married in June at The White Oaks Barn in the beautiful North Georgia mountains. Katie's brother made wood signs for the reception which I lettered, and I used a few of my rustic chalkboards to complete her lettering requests. I think you will see from the signs that Katie and Brantley wanted to center their wedding around the One who brought them together. Thank you for the privilege of taking part in your special day. Best wishes forever, Mr. and Mrs. Gee! The couple paid tribute to their family members who were there in spirit. Katie's father wears many hats, one of which is farming. They gave tomato plants as favors to their guests. God is good all the time, but especially today! Yesterday was a great day for "The Big Event" at Lake Oconee Village in Greensboro, Georgia. While rain was likely, it turned out to be a warm and sunny spring day! The crowds were steady all day long, and it seemed like everyone had a great time seeing what Georgia's lake country has to offer. Kids ate plenty of ice cream, all around you could smell great food, the music was lively, and the booths were awesome. Wendy Myers and her staff at the Lake Oconee Builders Association did a fantastic job making this festival happen. A couple of new items made their debut in my "travelling" calligraphy boutique: hand-lettered "Lake Oconee On My Mind" Coozies, courthouse prints and notecards, and "Bless Your Heart" stationery. The coozies are the very first items to roll out under my "What's on My Mind" line of calligraphy products. I began selling individual hand-lettered greeting cards because I have had so many requests for them. These are special because no two are alike! "Bless Your Heart" notecard sets (copyright by every true southern lady) and handmade greeting cards. Thank you to all of my friends, both old and new, who stopped by to check out my work. Even my sister-in-law and brother-in-law drove all the way from Gray to make me feel loved :). Thanks to my family for coming to support my little shop! I look forward to bringing my calligraphy boutique to downtown Greensboro for the Southland Jubilee on Saturday, April 16. I am working on some new pieces that I will be so proud to add to my shop. Hint: These pieces will add lots of sweetness to your baby's nursery. Let me know if you would like for me to set aside something for you! See you at the Jubilee!